This is what I found at Sainsbury's yesterday. That's not right, is it Doctor ?? I'm not sure I was thinking finger, if my Mum reads this, I was. I thought it was a finger. Yuk. Nice bag though. Lovely bunny. 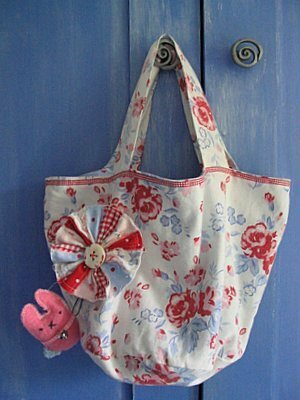 That bag is lovely - the fabric is so pretty and I really like the little patchwork rosette (and bunny!) that you've attached to it - fit for a country lady! 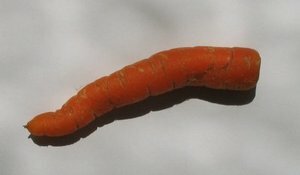 And yeah, what is with that carrot?!? Hello! 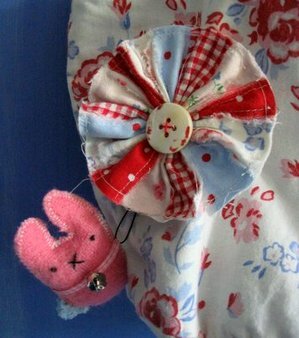 I've stumbled across your website whilst searching for inspiration for felt corsages of all things. Yes, I seem to have THAT much time on my hands! I love your stuff! It's fab! Now you see that corsage thing (which isn't felt!) on your niece's bag??!! How for the love of god do I do that? Warning: I can't sew very well (buttons and name tags a specialty!). I want to make a present for someone and though I'd do the "here's something especially for you by me" whilst wiping the tear from the corner of my eye!! !